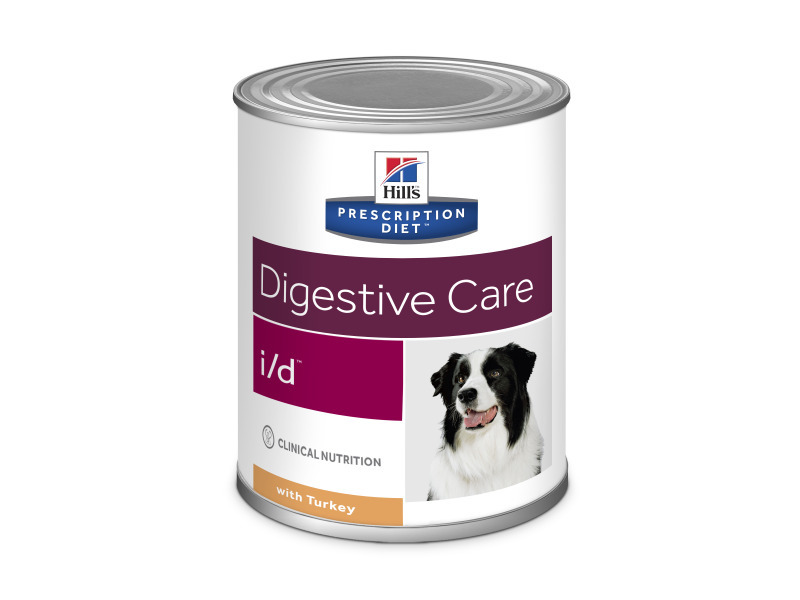 Hill's Prescription Diet i/d, available from VioVet, has been developed for dogs suffering with gastrointestinal disorders. Such disorders affect a dog's stomach and intestinal system and have symptoms that are both often painful and prolonged. Hill's Prescription Diet i/d has been specially formulated to be highly digestible and to encourage symptom reduction of vomiting and regurgitation, flatulence, constipation and diarrhoea. Further complaints associated with GI disorders include pancreatitis and gastroenteritis, both painful conditions that cause abdominal cramps, internal inflammation and sickness. 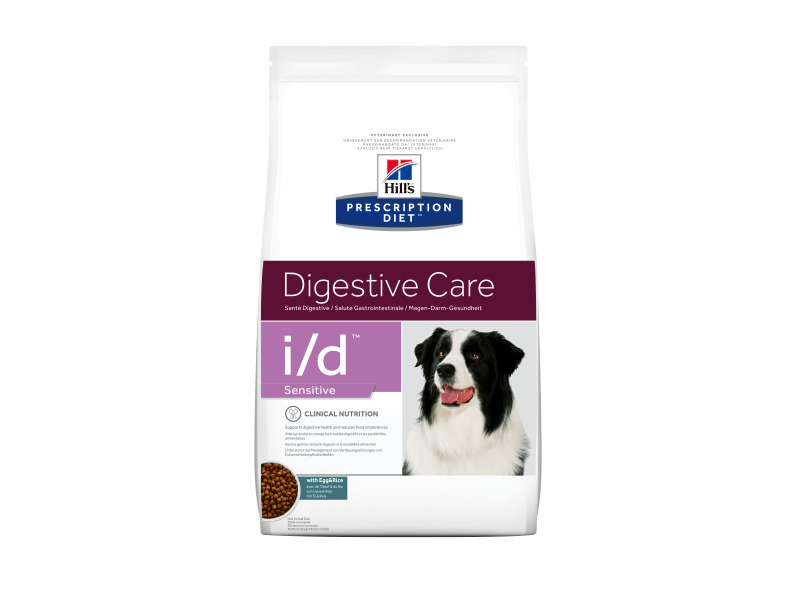 Prescription diet I/D is tailored to the nutritional needs of dogs with GI disorders, as well as those recovering from gastrointestinal surgery. Based on a puppy's age and weight, feed the same number of large cans, or grams of dry food, as shown for Puppy Healthy DevelopmentTMin the Daily Feeding Amounts for puppies plus an additional third (33%) for i/d Canine canned or an additional 10% for i/dTM Canine dry. A 360g can is equal to 100 grams of the dry food. Digestibility High Improves availability of nutrients whilst allowing for recovery of the digestive tract. Fat Reduced Helps limit vomiting and steatorrhoea. Soluble fibre Increased Provides short chain fatty acids to nourish enterocytes in the colon and restore intestinal flora. B-complex vitamins Increased Helps replace losses caused by vomiting and diarrhoea. Superior antioxidant formula Added Neutralises free radicals associated with gastroenteritis. Ingredients (Dry): Chicken: Brewer's rice, maize starch, wheat, maize gluten meal, chicken (18 %) and turkey meat meal, digest, flaxseed, beet pulp, minerals, barley, oats, animal fat, ginger root powder, soybean oil, vitamins, Lysine, L-carnitine, trace elements, Taurine, Tryptophan and beta carotene. With a natural antioxidant (mixed tocopherols). Provides complete balanced nutrition for growing puppies as well as adult dogs. In acute pancreatitis, feed only after the initial stage during which all food and liquid by mouth are withheld. Gastrointestinal disorders: gastritis, enteritis, colitis, inflammatory bowel disease (i.e. most causes of diarrhoea, plus malabsorption, bacterial overgrowth, lymphangiectasia). Recovery from minor surgical procedures and mildly debilitating conditions. Bloat (gastric dilatation and volvulus). 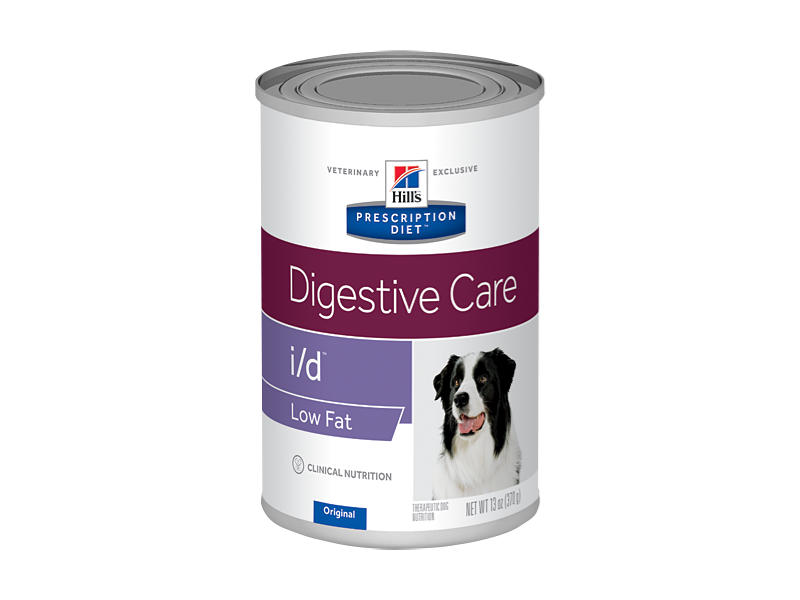 A 360g can is equal to 102 grams of the dry food. Adjust the feeding amount to maitain optimal body weight. N.B. Supplementation beyond the i/d Low Fat canned or dry formula is unneccessary and may decrease the effectiveness of the food. Electrolytes Increased Replace those your dog may lose from vomiting or diarrhoea. Pork, turkey, rice, rice flour, maize, minerals, egg protein, flaxseed, dried beet pulp, cellulose, digest, dried whole egg, soybean oil, ginger root powder, vitamins and trace elements. Rice, maize starch, maize gluten meal, chicken meat meal, digest, barley, flaxseed, dried beet pulp, minerals, vegetable oil, ginger root powder, vitamins, L-carnitine, L-lysine, trace elements, taurine, tryptophan. With natural preservative and natural antioxidants. Gastrointestinal disorders: gastritis, enteritis, colitis (i.e. most causes of diarrhoea, plus malabsorption and bacterial overgrowth) and for bloat (gastric dilatation and volvulus). 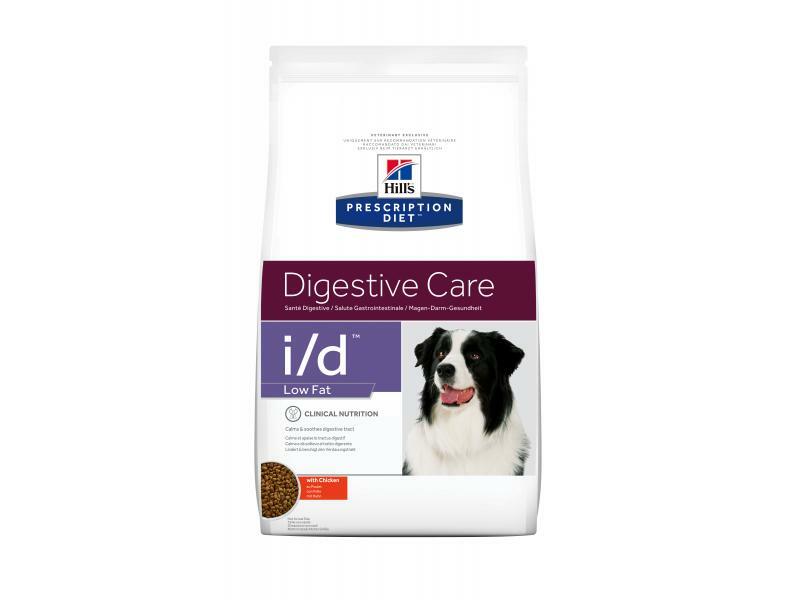 Below are some recent questions we've received regarding Hill's Prescription Diet i/d Digestive Care Dog Food, including answers from our team. on looking at I/d for dogs, the dry and the low fat seem to have the same amount of fat in. Am I reading this correctly? The normal I/D contains 14.7% fat and the low fat only contains 8.5% fat. My dog has regularly has an upset tummy. At this stage we do not know what is causing this. Vet has ruled out cushens disease and tumour. When she is on ID Sensitive, all appears ok. I would like to order more cans, but do not know which type is best for her, the recovery pack or the sensitive. We would love to be able to answer your question but as we are not veterinary trained and due to the nature of your query, we would suggest that you contact your vet on this occasion. They will know what is best for your pet and will be able to examine and advise appropriately. One of my dogs had severe pancreatitis and i have to find a low fat food for him. My other 3 dogs will need to eat the same food as they all move round each others bowls! Is this safe long term? This should be okay to feed long term but it would be best for you to contact your vet or Hills directly to see if this would be suitable, as per your treatment plan. My dog got diagnosed with liver decease and was told to put her on hepatic L/D, but blood tests are now clear but have been told to keep her on it incase of relapse but she also has sensitive stomach and so I'm thinking of putting her on L/D dry and i/d wet tins. Can someone advise me if that is ok? Blood tests for liver problems are very sensitive so if she is clear on a blood test, you probably have no real need to continue with a liver support diet. The i/d food is probably very appropriate for her so I would keep her on just that. Can this be fed to a dog with ibd? My dog has been diagnosed with ibd and I want to change her from royal canin. Can this food keep her on track? 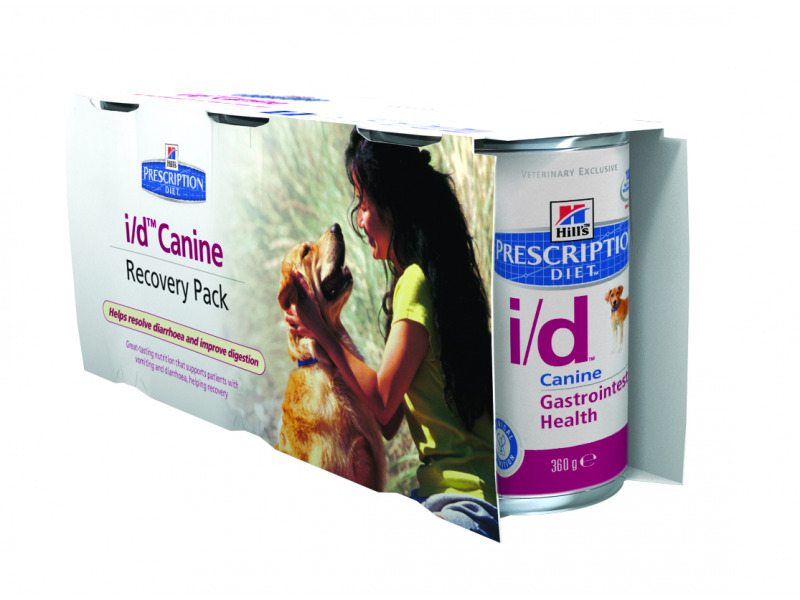 This food will suit many dogs with IBD but not all.. It is a variable disease and some individuals can be sensitive to components of almost any diet. Usually there is a period of experimentation with a very limited amount of different foods allowed, to ascertain what suits the individual involved. The main thing to look at is the ingredient list of the diet. If say maize, or turkey, cause trouble, they will almost certainly do so in any brand of food. 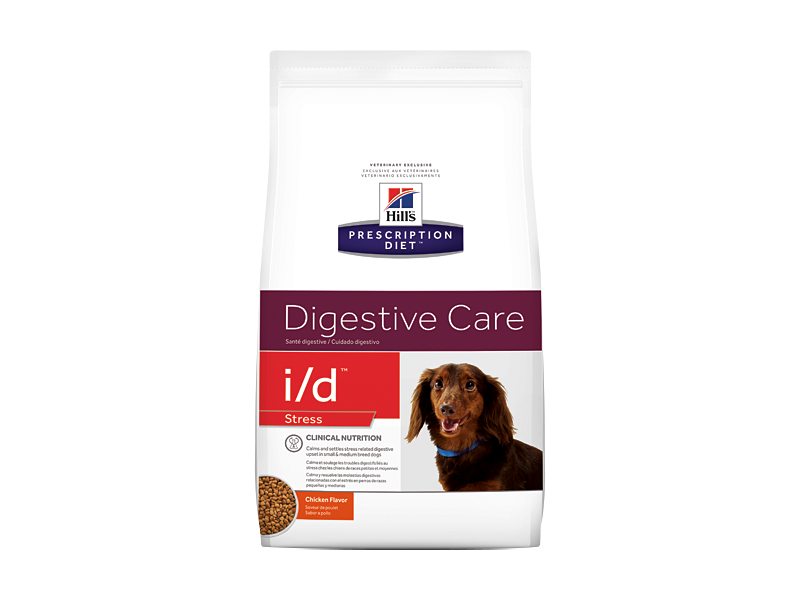 Hills i/d contains maize and turkey, they are perfectly good for many dogs with IBD, but for some they would not be suitable. It is important to talk to your own vet about what is suspected to be possible triggers of the IBD, then choose a diet accordingly.